Spreading the warmth of Torah can be done in many ways, but nothing captures the eternity of Torah like the printing of original Torah works. Our holy books have lasted through the ages, transcending time and space, ever engaging the scholar in pursuit of knowledge. Kollel NH is therefore proud to announce the opening of MACHON NER HAMIZRACH (lit. Kollel Ner Hamizrach Printing House) and the release of its first publication SEFER EINEI NISSIM on the Laws and Customs of Schitah and Treifut. Authored by one of the great leaders of Sefardic Jewry, Harav Nissim Azran, who served as Rabbi in Al Jadida, Morrocco, Sefer Einei Nissim was brought to print through the untiring efforts of the authors grandson, our dear friend Mr. Michel Azran, who has authored the introduction to the work. Mr. Azran worked closely with the Rosh Kollel, Rabbi Eliezer Cohen, who reviewed the manuscript and personally oversaw the typesetting and publication. Another project nearing completion is the ITALIAANDER EDITION “KOVETZ KESSER TORAH” the annual Torah Journal of Kollel Ner Hamizrach set to be released in the coming months. 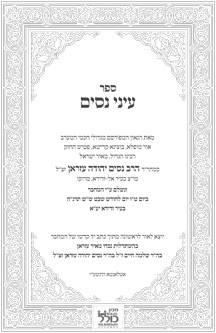 Aside from original Torah novellae composed by our own Kollel Rabbis, the work will also contain original never-published essays by the likes of the great Harav Ahron Kotler z”l Rosh Yeshivah of Lakewood, Harav Reuven Grozovsky, Rosh Yeshivah of Torah Vodaas and Beis Medrash Elyon of Monsey, Harav Berel Soloveichik Rosh Yeshiva of Yeshivas Brisk of Jerusalem, Harav Malkiel Kotler Rosh Yeshivah of Lakewood, Harav Shmuel Kaminetsky Rosh yeshivah of Philadelphia, Harav Moshe Heinemann of Baltimore, Harav Shmuel Khoshkerman, Harav Eliezer Cohen, as well as a reprint of a rare essay composed by Rabbi Tuvia Gefen of Atlanta in 1968 related to the topic currently being studied at the kollel. At this time Machon Kollel Ner Hamizrach is reaching out to those who have valuable manuscripts and seek to publish them, but are intimidated by the perceived difficulties of the printing process. The Machon will advise and guide people through the various steps as needed.